As part of the Marketing Bullseye series I will interview people who 'get it'. Rich Lloyd is one of those people. Rich Lloyd and I worked together for 7 years at Dell. While I ran the consumer web site, he built the email and My Account capabilities for Dell. When I ran Consumer CRM, he was leading Dell's Global database infrastructure & CRM efforts. Rich has an extensive background in database and direct marketing and has a Harvard MBA. That's enough to say he knows his stuff. And on a personal note, he's an all-around good guy! Rich recently joined Peruvian Connection, a multi-channel hig-end apparel retailer, as President. Rich understands measurability and word of mouth, and looks to several key principles to get as much return from imited resources as possible. Here are a few questions I posed to Rich. When you joined Peruvian Connection, how did you figure out what was or could be the most effective marketing? A big part of this decision was looking at historical performance and realizing we'd had a successful, but fairly one-dimensional marketing approach. A beautiful and efficient catalog had been successful, but was tapping out in terms of reach, and needing to be augmented with a broader portfolio of marketing tools with different price points and different audience reach. Online marketing, in particular was an attractive area to ramp quickly on both of these dimensions. eMail and search have been very efficient and effective thus far. What key principles would you suggest to a marketer coming into a new company who's job it is to grow the business with existing resources? Treat the marketing budget as a fixed and finite resource that needs to be optimized not only for cost but for reach. Make the dollars you have go farther, well before you spend new dollars. Growth can only happen if more prospects become customers, or more customer by more often or in greater quantities, and marketing dollars have to be used for these ends. ROI is an obvious measure to help do this, but I think an underrated measure is reach (along with frequency). For example, the broad reach of search today makes it such an efficient prospecting tool as compared to catalog list rentals, historically just about the most efficient consumer marketing technique to bring in new customers. How do you decide marketing investment allocation on things that are measurable vs. things that are not? It sounds simple, but I honestly give measurable marketing entities a "gross up" factor to account for their measurability. That is, I'd rather have ROI of 2.5x on something I can perfectly measure than 3x on something that is only partially measurable and requires hypothesis for the rest of its performance. For example, take a print ad campaign that where only some of its worth can be measured (through vanity URLS and unique 800 numbers)... vs. exact affiliate sales. I'd measure the two on an ROI-basis, obviously, but I'd require a higher hurdle rate from the print ad.. .why? because the value of being able to more precisely measure something gives me some quantified value beyond just apples-to-apples response. How does Peruvian Connection think about word of mouth? What are you doing to drive word of mouth for your company and its products? We start with every customer interaction and transaction. I think the best brand building happens with every interaction. Rather than spend a ton of money on brand-building or word-of-mouth ads, we invest in customer sales and service. We have built a great brand over 30 years in this quiet and dependable way. Our customer loyalty is outstanding and comes from incredible "bend-over-backwards" homegrown Kansas service and from incredible customers who buy and wear our unique "get talked" about works of art year after year. We know this is our best word-of-mouth, but we also actively encourage referrals, have a long-standing VIP program, and do everything we can to stand behind our products for a lifetime. The bulls eye concept because it not only helps describe middle-brain marketing of blending creativity with measurement, but it also conceptualizes the idea of choosing the most effective way to do things. So what’s the bulls eye in copywriting? Many marketers look at their competitors’ web sites and copy. In the end, every site looks like the other and clever white-paper-speak terms emerge. Terms that are not the language of the customer I don’t think that’s what copywriting means!. These aren't the words your customers are using to describe what they need, what their problems are or what they're looking for. They're not looking for "human capital management solutions" - they're looking for a staffing company. They're not typing "human capital management solutions" into search engines. They're typing "staffing company" or "staffing services". Andrea Learned describes how Intuit hired an editor from People Magazine to reinvent their terms for QuickBooks. Accounts receivable became 'Money In' and accounts payable, 'Money Out.'" Follow your customers home. What is in their magazine rack? What words do they use when they email or IM friends, and so on? This sort of anthropological look should give you some in-depth insight as to how you can make your marketing language more relevant for customers. Read what they read. Hang out where they hang out. Visit the web sites they frequent. Above all, if you can - identify a writer who speaks your market's language and pay them whatever they want to freelance for you. It will be worth it. Just look at Simple Start. You want copy to be alive, active, vibrant, succinct, and contain powerful verbs. You also want to write with simple words (see recent grokdotcom article on Can Your Customers Read What You Write?). And in all of this, to hit the bulls eye in your copy, use the language of your customer. There is an article in the recent MarketingProfs that is a great way to think about whether or not to do a marketing activity -- and therefore a great way to prioritize marketing activities with limited resources. Essentially you must conscsiously ask yourself or your team a set of questions to determine if any given marketing activity will be a credit to your brand 'checkbook', or debit. Just as your personal checkbook has credits and debits, a brand checkbook has credits and debits in the form of brand credits and brand debits. "Brand credits" are business activities that enhance the reputation and perception people have of a brand, and "brand debits" are those that detract from the reputation and perception of the brand. When faced with determining the appropriateness of marketing activities such as a promotion, sponsorship, program, or special event, the marketing department first determines whether the activity is a brand credit or debit. Does the marketing activity respect the intelligence of Starbucks customers? Can Starbucks expertly deliver on all the promises made to customers in the proposed activity? Will Starbucks employees be excited and motivated by the activity? Will customers view the marketing activity as being clever, original, genuine, and authentic? If the marketing department answered "yes" to three of these four questions, then the activity is considered a brand credit. On the other hand, if Starbucks marketers answered "no" to more than one question, then the activity would be considered a brand debit. The Starbucks marketing department would then need to discuss the business importance of doing that brand debit activity. 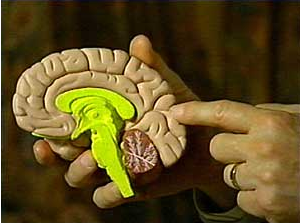 In my father’s book, You've Got To Be Believed To Be Heard he calls it the 'First Brain.' Malcolm Gladwell in his great book Blink calls it the adaptive unconscious. Without getting into a lot of detail, in the center of our cerebral cortex there is the limbic system (our emotions) and brain stem (our unconscious habits are housed here.) Together they make up our pre- or unconscious brain. The fact is that all of our sensory input — the nerve pathways from our eyes and ears for visual and auditory — and taste, touch and smell as well — go into our First Brain first, before they are shunted out into our conscious cerebral cortex thinking brain. So at the unconscious level, we are making many emotionally slanted decisions before we even can think about them. In Blink, Gladwell calls it "thin slicing." What does that have to do with bulls eye marketing? Well, purchase behavior (even B2B) suggests people buy on emotion and justify with fact. First impressions make a difference. Before they actually read, hear or watch your message, customers have determined their feeling about it. And it’s the feeling that matters. Bulls eye marketing is about being efficient and effective. Therefore any marketing message must cut through the first brain to be considered for the intellect to take action. In other words, it must be trusted to be persuasive. And since 97% of customers don’t trust advertising, perhaps your message shouldn’t look like advertising! That’s why the best marketing is word of mouth marketing, or as Andy Sernovitz puts it, C2C marketing. According to an Edelman Group study, “trust in someone like me” has exploded from 20% to 68% in three years. A ‘marketing’ message sent from an unbiased source is coated in authenticity, getting past the first brain. Is the copy personal? Is it written in a conversational style? Does it have a perspective, opinion, or position? Is there something funny, interesting, curious, alarming, or something in the message to stir emotion? Are you telling a story? Who’s doing the talking – someone credible and interesting? For example, MarketingSherpa reported in a B2B marketing study that whitepapers and webinars are two of the most effective forms of B2B marketing. Why? Because they are educational and valuable. There may be an infomercial inside, but the assumption with these vehicles is they are educational, informational, and will provide value to me. Notwithstanding word of mouth, good marketing provides value to the customer because it is more trusted. This topic alone are subjects of several books. The simple principle to remember before sending anything out to a customer or prospect is the smell test. Look at your marketing and determine does it ‘smell’ like advertising and marketing? Or does it smell like something that is credible, interesting and valuable? 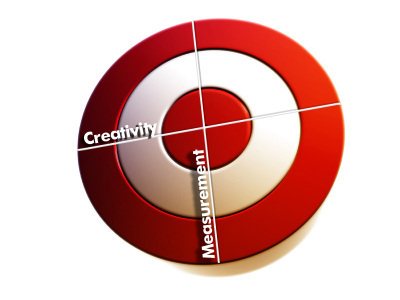 Hitting the marketing bullseye is balancing measurement rigor with creative relevance. For example, Southwest Airlines maintains efficiency without losing creativity or soul. You can get a $150 flight (efficiency through operational rigor) while the flight attendant recites FAA rules impersonating Robert Deniro (creativity and ‘soul’). Up until now I’ve posted blog entries in the "longitude" dimension of the marketing bullseye --metrics, optimization, and finance. Now, for a principle in the “latitude” dimension. These will be posts about purposeful creativity, first brain marketing, salience, and principles that drive word of mouth. This post covers a strategy that creates word of mouth and loyalty but may lack empirical justification: "The Unexpected Touch". When is the last time you were surprised and delighted by a small unexpected gesture from a company? The reason the unexpected touch works is because neither you nor I can think of an answer! To be unexpected, you should choose to do something that goes outside the range of what the most demanding customer may expect from the product or service you provide. It is different than adding a great feature or executing perfectly on service. I love my iPod, yet it has many features I don’t use. If Apple put a dollar more of software features (conceptually), it wouldn’t make as much impact as a dollar they put into the premium packaging (which I haven’t thrown away because it’s so cool). That packaging makes me feel good about spending the $400. But that is not unexpected. That’s just smart feature allocation for a high-end, word-of-mouth-worthy product. An unexpected touch is different than an unexpected feature or service enhancement. The point of ‘touch’ is that it creates a human connection. Either the unexpected act is coming from a person or because the act itself touches (double meaning here!) the customer on an emotional level. Gratitude, humor, surprise, joy. Here’s an example of touch. I don’t think this is going to make you well up or anything, but considering it’s coming from an oil company, who knows? This is unexpected, because there is no advertising where you’d expect there to be advertising. 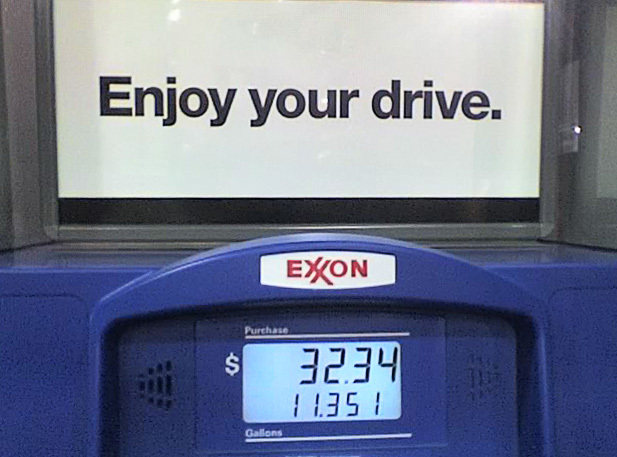 It is a touch because it made the driver feel Exxon cared. It’s not going to change your life, but it didn’t cost Exxon anything either. Most importantly, the unexpected touch makes you think and feel differently about their brand and be compelled to tell someone about the experience…as it did for our designer, or he wouldn’t have taken and shared this picture! You have to do something to make you feel good about spending $32 to fill your tank. I have spoke at several conferences on 12 principles to put eBusiness into the heart of your business. However, these principles are applicable to bring about any change to the center of your culture – assuming your culture cares about metrics. There is a heart in your business. It is often hard to articulate, but you know the people, meetings, and general culture from which most decisions and actions originate. Your project, program or department may or may not be in on this heart of the business. Often times, eBusiness is not at the heart of a corporation, for example. Usually, change leaders are not at the center of day to day business. They are running the marathon and everyone in the day-to-day around them is running a sprint. So how do you make change happen that hits the marketing bullseye? The best way to get into the heart of the business is to use metrics. Metrics can’t be ignored. They force attention of sprinters who are looking at metrics every day. And, they most importantly, they get the attention of senior management. They give something for people to put on their resume. And they give your overachieving peers something to work towards. The strategy is to create a system around you using metrics to build momentum for the right (bulls eye) projects, programs and initiatives. 1. Democratize – standardize the data and give open access to the data or reports to the masses. 2. Focus – what are the killer metrics / levers in the business? Does everyone know what these key metrics are? 3. Own – give people ownership for key metrics. Someone who pulls together the team to drive the metric, educate, evangelize, report. 4. Partner – put goals in performance plans of cross-functional partners. 5. Define – Define your metrics in ways people can understand. Use industry standards. Describe definitions in laymen’s terms, and educate the masses. 6. Report – Create an easy to read, regularly updated, consistent report that is distributed widely. 7. Co-habitate – Merge your analytics with standard business reporting. Where are the eyes on the business? Put your metrics there. Put them at the top. Don’t reinvent reports and channels. 8. Visualize – Show some meaning behind the numbers. Connect emotionally, create internal buzz and sound bytes. 9. Causate – Show the connections of what causes what: Y=f(x). This is a Six sigma methodology. Do A/B testing and pilots to show what moves these metrics people are now paying attention to. 10. Extrapolate – Show what if scenarios. If we do this, this lever changes, makes this customer or P&L impact. Then extrapolate to larger number (a quarter of a year of impact) to get a lot of attention. 11. Compete – Create internal competitions to improve metrics. Inspire people with stretch goals with a “Results Rabbit” for people to go after. 12. Share – Present results of business impact related to web metrics. Show the impact to the business. Usually the biggest impact you can make in a business is to create a system by which people pay attention to what is important. Create this system using metrics to shine a light on the right ideas and get people to change! Last week I was lunching at a barbecue restaurant when I saw a gumball machine with a coupon flyer on top of it. I wondered if the person managing the gumball machines was the same person distributing the coupons that sat on top. If they weren’t they missed out on a key bulls eye marketing principle: Piggybacking. In a world of limited resources, you should leverage and maximize existing marketing "working capital" to carry your messages. There’s a disproportionate amount of investment to start a new program, campaign or initiative than to add something onto an existing campaign. The idea of piggybacking is to look at any marketing program and piggyback on it with another marketing message. Or, alternatively, piggyback every marketing vehicle to reinforce your main message (example: logos on delivery vehicles, URLs on receipts, etc.). Think about all of your customer touch points and ask yourself, what else could be added that wouldn’t take away from the primary message. Can you add a cross-sell to a landing page that may entice a visitor to think of buying something else before they leave. Can you add something to what you ship the customer? Can you add a message onto your voicemail? Can you add a message from your customer service, sales or support representatives? Do you (moderately) leverage links from one page to another page in your site (The Resolving Door concept). The IDEA and PRINCIPLE of Piggyback is to look at any and all activities and consider how it can be added to and leveraged and maximize its full potential...but not past the point it becoming overwhelmed, cluttered, or diluted. Many years ago the VP of Marketing for Micron PC bought the sponsorship for a college bowl game, paying $500k for the sponsorship to have the game called the “Micronics Bowl”. As the premiere sponsor they got the logo on the field plus a number of other advertising placements. The VP resold these other advertising spaces to partners…sort of a subleasing of this advertising space. In the end, the parts were greater than the sum, and he resold the multiple advertising placements for a total of $500k…allowing Micron to have their name on the field and the bowl named after them for free. I grew up learning basketball from coaches that enforced learning the fundamentals (to stray meant line drills!). That meant practicing with proper shooting form, basic passes, game-time shots, etc. When he wasn't watching I was perfecting fadeaway jumper, hook shot, half-court shot, and attempting to slap the backboard on a reverse layup! They were more fun, but I rarely used them in a game (or when he was looking). Bullseye marketing is focused on the fundamentals first. Sure, you can try the half-court shot marketing ideas...but odds are you will hit the outer rings. Why not first execute on activities that will make the most impact. Get customers to frequent more often. Estimate the headroom/opportunity for each of the above strategies at that point in your company lifecycle (i.e. a new company needs #1 before #2 can be impactful). Set goals for each. Set stretch goals for each. Pretty basic, right? Hitting the bullseye in marketing is not complicated, but can be difficult -- because most of the time it is finding the low hanging fruit and executing well on fundamentals. That seems to be difficult for most organizaitons. Taking action on the basics (note: does not mean lacking in creativity or relevance) drives 80-90% of the impact in an organization. Unfortunately, it's also these basics that get forgotten or ignored in 80-90% of organizations. 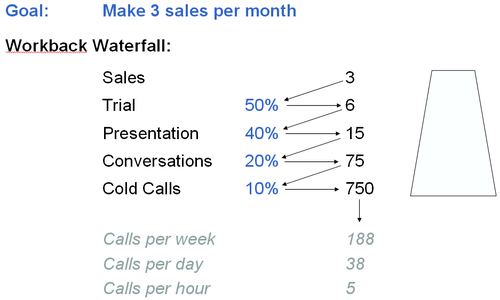 A couple posts ago I talked about the P&L aspects of marketing cost scaling. A key factor to marketing costs scaling is for marketing programs to scale. In effect, any marketing initiative or process created should be sustained and optimized for less resources over time. The best marketing programs are those that get set up, perform, and don't require my attention. This is and was my philosophy as a marketer and online retailer, and I've heard this from many of our online retailing clients now. Some may require attention, but for the same effort, grow in impact over time. Search engine marketing (except for the costs going up) you can set it up once and it can run and optimize with limited bandwidth. Web site functionality -- features that live on the site with one time cost which drive conversion or attract new customers (could drive word of mouth). Email newsletters -- same effort each email can drive more results as email list grows and we test/measure as part of the process to make them more effective. Custom marcom, letters, or mockups for every prospect that calls. Advertising campaign that requires new creative often, rather than using creative templates or getting more out of one creative. Custom direct mail that requires a lot of versioning and effort each time, but delivers limited incremental lift each mailing. It costs signifant time and effort to set up a new program or process -- much like it costs a lot more to attract a new customer than to keep one. Whenever considering any marketing program, consider the maintenance, support, and optimization requires to get the same results or more out of that program over time. All effort into the sustainment of that program is effort you forego to create a new one. As a colleague once said, "Is the juice worth the squeeze?" Another consideration is to people-proof the program. Any program that requires specific expertise or specific person to run or optimize that program can be orphaned or sub-optimized when that talent leaves. Programs with good process around them and can be managed by multiple people have a good chance of sustained impact. As part of your bullseye marketing prioritization process, consider the factor of resources to sustain and upside opportunity to optimize. Consider your time as working capital, and you want the best return on capital as possible. I once gave a presentation to an industry group called "Rivers of Revenue: How to Build a Marketing Machine". In that presentation, I showed an approach to 'processize' your way to achieve a quantifiable goal. I call it a Workback Waterfall. It's nothing revolutionary...but many things that hit the marketing bullseye are not spine-tingling. Essentially it requires you determine what you want to accomplish, then define the steps to get there and then work backwards and determine the 'waterfall' of variables that measure the success of each step. Start with the goal in mind, and work back the steps necessary to achieve the goal. Then play with the variables that are necessary to achieve each step towards the goal. Track progress and success of those steps so you can measure actual results of those variables. Adjust variables to forecast future progress. Optimize each step and the process to reduce effort to achieve each step...and reach the goal. By starting with the goal in mind and working back the steps and measures along each way you can identify the activities and behaviors to hit the goal. And, most importantly, you measure the true effectiveness of each step and identify ways to improve productivity for each one. You could double or quadruple impact. This is a simple way to achieve any goal, as it forces you to identify the process and compels you to optimize productivity. You could use this for direct mail, email, online conversion, tradeshow selling or other marketing processes. Using an approach like this makes me a believer in the old addage: "If you can measure it, you can manage it!"